The Walk to End Alzheimer’s is the worlds largest event to raise funds for Alzheimer’s care, support, and research! 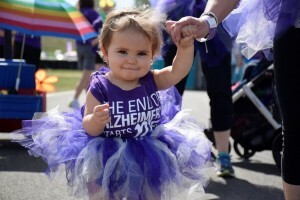 The Walk provides an opportunity for the Alzheimer’s community—family and professional caregivers, those diagnosed with Alzheimer’s, people who have lost a loved one to Alzheimer’s, and those who know that Alzheimer’s could impact them at any time during their lives—to come together and say that NOW is the time to fight back. The Walk offers the community a chance to see the courage and beauty of people who are fighting a disease that will ultimately win. It offers hope that in the near future this disease will not be victorious—it will be treatable and, eventually, curable. Most importantly, the Walk to End Alzheimer’s brings people who are in the midst of an incredibly isolating disease the chance to see that they are not enduring this disease alone.